Deltiology is a hobby closely aligned with stamp collecting, finding many stamp collectors and philatelists active in the area commonly known as postcard collecting. The postcard's golden age, when folks would send a card to friends at the drop of a hat, was roughly from the turn of the 19th century through the 1920's. So what does the deltiologist collect, if not quaint scenes of main streets, European statues, natural wonders, train wrecks, or cute moppets? 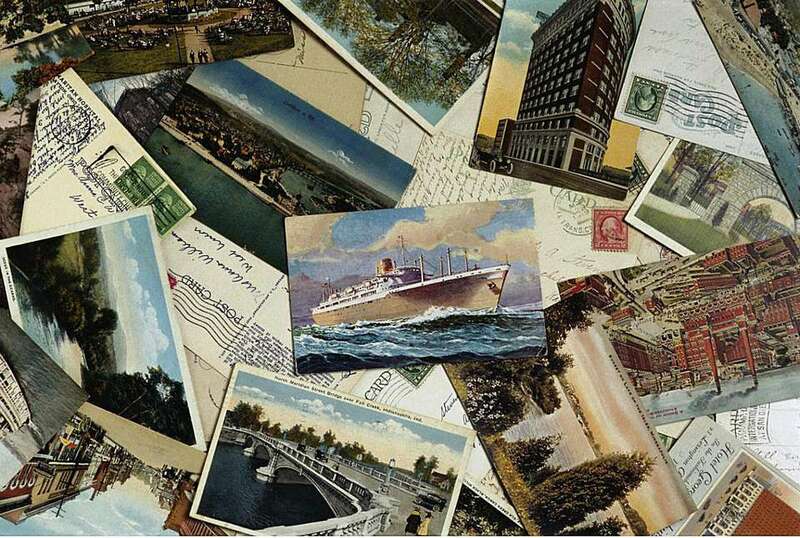 Can postcards beyond those with simple greetings do the job of to attract stamp collectors? In many cases, they can. In situations where weight was a concern, for example in airmail where a savings was had over letter rates, postcards were popular. Especially in unusual aircraft where load weight is critical, such as balloons, postcards are the preferred method of postal commemoration. This dates back to 1870 when lightweight cards were used by Parisians to send information out of their besieged city by balloon. Extremely lightweight cards, almost see-through, were also carried by pilots in balloon races in the early part of the twentieth century. One area where the postcard had it all over the cover is in presenting artwork. You simply couldn't get the same effect on bond or rag paper of the envelope that was obtained with lithography and other printing processes common to postcards. Artist signed postcard collecting is extremely popular and some of the big names include Mucha, Clapsaddle, Brundage, Greenaway and Kirshner. Their prices routinely break the one hundred dollar mark and often go far above that price point. Of course the main postal art collecting area is the first day cover (FDC), with its envelopes containing artistic cachets tied into the stamp subject. The word cover is an integral part of the name, obviously, so you would be correct to assume that first day postcards are generally not welcome in the collection of the FDC collect. Postcards can be more than just of the "having a wonderful time, wish you were here" variety. In fact there are postcards of great poignancy. Many military people have traditionally corresponded with loved ones via a quick postcard message, either in Red Cross type formula message cards, or sadly, with POW cards provided by their captors. It is known that immediately following San Francisco's reconstruction after the earthquake of 1906, the next order of business was to attract the Panama Pacific International Exhibition of 1915. One of the big helps in clinching the host duties for the previously decimated city were a deluge of San Francisco booster postcards, a trend which started around 1910. In the Oakland Museum of California exhibit Aftershock! Voices from the 1906 Earthquake and Fire there is a postcard mailed in 1906 that reads "From inquiring friends we have received your name as among the missing since the disaster of April 18. If this postal reaches you, will you be good enough to reply on the attached card and mail it, in order that we may relieve the anxiety of those from whom the inquiry comes. No stamp is required." But postcards are mostly for fun: Though Henry Cole, the assistant of Rowland Hill, inventor of the Uniform Penny Post said that humankind's higher ideals "are all advanced by correspondence" he was surely talking about covers and not postcards. After all, Britain's Saucy Seaside Postcards of the WWII vintage with their curvy ladies and leering men don't advance anything except a sense of naughty fun.